So earlier this week when I announced our disappointing news, I mentioned that I may not be up to par when it comes to blog work. I may be here some weeks, other weeks maybe not so much. When I said that, I had no intention of actually getting a recipe up for you guys this week. The last thing I’ve wanted to do is bake, let alone take pictures of the final product and write about it. Don’t get me wrong – I absolutely LOVE blogging and everything involved in the process. But this just isn’t the week for my best work. So anyway, I wasn’t planning on it. I had intentions of pulling a recipe from the archives and blasting it all over Facebook so you’d think it was new. (not that i’ve ever done that before…) But yesterday morning as I was checking my email, a recipe caught my eye. 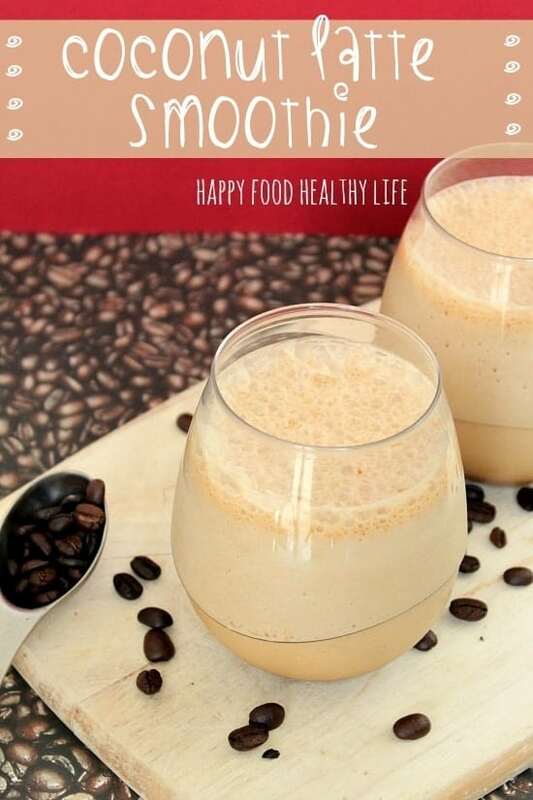 Coconut Latte Smoothie using just a few ingredients that I already had! Do you remember yesterday’s post where I mentioned having “staples?” You know, things people know you for? Well, Coconut and Coffee are two of things that people think of when they think of me. So with my birthday this week, I just knew it was fitting to serve up a beverage that suited me and my thirty-year-old taste buds. And for all you non-caffeine consumers, don’t you worry your pretty little faces. I’m still taking it easy on the caffeine, so I just used a decaf coffee, and it was still pretty dang perfect. * This is my first photo shoot in the new home and I don’t know the best spot for lighting. * I edited and picked fonts quickly for these pics and am not in love with them. 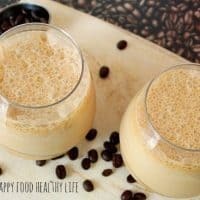 I have never tried coconut milk in my coffee but now I want to try! It’s yummy! Just a hint of that coconut flavor I love without being too overpowering. I love the way you staged your picture for your post. The coffee bean background mesmerized me. I’ve tried neither coconut milk nor vanilla protein powder, but the combination sure sounds good! Thanks Paula!! I’ve was feeling blah about my super quick staging, so I’m glad to hear that you liked it. I don’t drink coffee and am one of the few people who doesn’t even like the smell. Do you think this would work with hot chocolate? I think it would be PERFECT with hot chocolate!! In the island’s yhats how we make our hot chocolate eith coconut milk. Really good. This looks amazing Holly! Pinning and making . . . tomorrow. 🙂 Still thinking about you all the time! I bet that is delicious and so refreshing! It SOOO is!! I could go for one right now actually! I love the layout and this sound so yummy!! 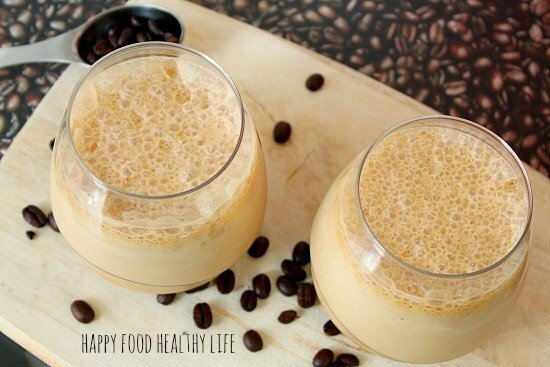 Do you think that chocolate protein powder would be good or bad with it?